Mention of Honor Senator Domingo F. Sarmiento. December 2016. Member of the Royal Society of Chemistry (RSC) with fellowship degree. Jury of the doctoral thesis of Msc Perttu Lantto, University of Oulu, Finland. November 2002. 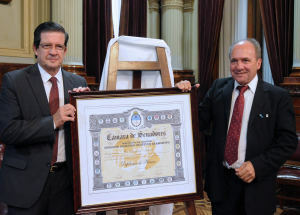 Prize: “José Luis Meana to the Builders of the Society”. Justice and Peace Commission. Setember 2005. Prize: “The Taragui in Education”. Corrientes. December 2005.